The Hotel Jadran is located on a small hill above Lake Bled. Embraced by green ivy, it looks like a romantic villa. Somewhat distanced from the lively beat of Bled, the hotel will impress those who want to start the day with an invigorating walk or run along the quiet part of the lake, alone or with pets, who are more than welcome at the Hotel Jadran. The Bled promenade is just a minute's walk on a pedestrian path along Lake Bled. 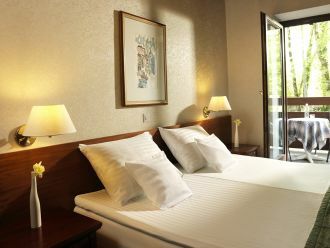 At the Hotel Jadran, you will experience the best of Bled at an affordable price. The Hotel Jadran is situated on the shore of Lake Bled. This three-star hotel has 45 rooms on five floors. The rooms have a TV and a private bathroom with a tub. Some rooms have a view of the lake. There are 15 parking places available for hotel guests. The hotel and rooms have free wi-fi. The hotel restaurant of the Hotel Jadran serves breakfast from 7.00 to 10.00. Other meals are available to guests in other facilities of Sava Hoteli Bled nearby. 50 m from the hotel is the Panorama Restaurant (open from 11.00 to 22.00), offering traditional and typical Slovenian dishes (lunch is served between 12.00 and 14.00, and supper between 19.00 and 21.00). The Park Café, the home of the original Bled cream cake, is 500 m away. The Živa Wellness pool complex features 6 pools: 4 indoor thermal pools, an outdoor thermal pool, a children's thermal pool, an indoor pool waterslide, a massage tub. Živa saunas include 3 Turkish saunas, 3 Finnish saunas, 2 pools with cold water – 14 and 21 °C, adventure shower. There is a bar next to the pool. Sauna opening hours: summer (2 May –31 Oct.) Mondays - Thursdays: 15.00–23.00, Saturdays: 12.00–23.00, Sundays: 12.00–21.00 / winter (1 Nov.–1 May) Mondays - Thursdays: 12.00–21.00, Fridays: 12.00–23.00, Saturdays: 10.00–23.00, Sundays: 10.00–21.00. Pools opening hours: Sundays - Thursdays: 7.00–21.00, Fridays, Saturdays: 7.00–23.00. Živa Wellness (250 m from the hotel) offers a wide range of massages, wellness programmes with a touch of the alpine, baths, facial care with renowned cosmetic products, a spa programme for youth, beauty and other treatments. We recommend you make a reservation in advance. Opening hours: every day from 8.00 to 21.00. 3.5 km from the hotel is the Royal Bled Golf Course, comprising the 18-hole King’s Course and the 9-hole Lake Course. In addition to the two courses, there are a large practice area covered with natural grass, Golf School, a golf equipment shop, wardrobes for guests and a storage room for equipment. The course also hosts the King's Club House. During the season (March–November), the golf course is open from 7.00–22.00, whereas in the spring and autumn the opening hours depend on the sunrise and sunset. The Hotel Jadran is situated on the shore of Lake Bled. Leave the motorway leading to Ljubljana at the Lesce–Bled exit. At the first roundabout, take the second exit. Continue straight on until you reach Bled. At Bled, descend the slope to the lake, go past the Grand Hotel Toplice and soon turn left up a smaller hill leading to the Hotel Jadran. It is 54 km to Ljubljana, 144 km to Trieste, 290 km to Venice, 360 km to Munich, 220 km to Graz, 378 km to Vienna, 515 km to Budapest, 198 km to Zagreb and 588 km to Belgrade. The closest airport is the Jože Pučnik Airport 35 km away. The Klagenfurt Airport is 65 km away. The closest bus stop is 1000 m away, while the railway station is 3.5 km from the hotel. We accept the following credit cards: MasterCard, Diners, American Express, Visa, Maestro, BA. Comfortable double room with a balcony overlooking the park. The room (12 - 16 m2) with a 180 cm wide bed or two 90 cm wide beds and bathroom with bathtub, shower and toilet. Comfortable and spacious double room with a balcony overlooking the lake. The room (18 - 25 m2) with a 180 cm wide bed or two 90 cm wide beds and bathroom with bathtub, shower and toilet, and a desk. Comfortable double room with a balcony overlooking the park. The room (12 - 16 m2) with two separate 90 cm wide beds and bathroom with bathtub, shower and toilet. 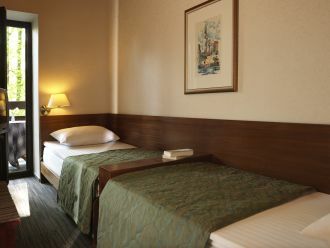 Comfortable single room with a bed 90 cm wide and lake view. The 10-12 m2 room features a bathroom with a bathtub with shower and toilet, a writing desk and a balcony. Bled is magical and captivating in itself, but a bad hotel can ruin the magic. This hotel was like a fairytale - the folks at the reception were very nice and upgraded my single room to a corner room. The view of the Bled Castle while lying in my bed would stay with me for a long time! Breakfast was a hurried affair at this hotel but the next day, they asked us to walk to their sister property across the road for breakfast, which was ooh-la-la. What I can't get over was the beautiful balcony, with the red and green leaves all across. Very comfortable stay as well and I loved the double doors. Somewhat raised above the peaceful part of the Lake Bled shore, you will find the ivy-coated Hotel Jadran. Pets are welcome. Hotel Jadran offers quality rooms at affordable prices. 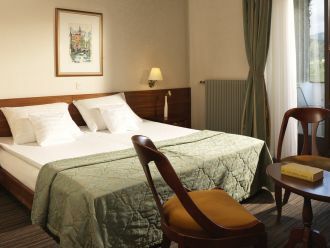 Half the rooms offer a splendid view of the lake and Bled Castle and the others of more peacef ...ul surroundings. Pets are welcome at the hotel and the rooms. 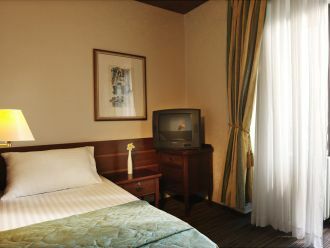 The hotel provides a full service for pets, including daycare and various walking schedules around Bled and its surroundings. A rich self-service breakfast is available in the breakfast room of Hotel Jadran for an energy-filled day to explore Bled and its surroundings. Other ...full-board meals are available just a few steps away at the Panorama Restaurant. The Panorama Restaurant boasts a magnificent view of Lake Bled, so be sure you choose a table by the window! It specialises in Slovenian dishes – choose a la carte or ask the serving staff what is recommended. Every day, the restaurant offers various advantages for hotel guests and visitors of Bled. The guests of Hotel Park can use the Živa Wellness pool complex featuring the biggest pools in this part of Slovenia free of charge or at a discount. ...The pools offer a magnificent view of Lake Bled. They are filled with thermal water. At Bled there are several springs of thermal water with beneficial effects on well-being. Pools on two levels with an indoor waterslide are also suitable for families. Saunas with light and aroma therapy and an outdoor cool pool and whirlpool with the best view await you. The multiple award-winning Živa Wellness is home to Alpine freshness and the Rikli healing concept, which benefits everyone facing a hectic pace of li ...fe on a daily basis. This healing concept cleanses them of the negative effects of stress while boosting their immune system and strengthening their spirits. The combination of local Alpine elements and the soul-cleansing break from the hustle and bustle of everyday life has given rise to original wellness products – muscle relaxing massage using spruce buds, beauty treatments using honey produced by local Carniolan honey bees, walks through the morning dew … And you will certainly respond to the allure of the saunas offering enticing views of the idyllic Lake Bled. The beneficial effects of the sauna are further enhanced by a cooling outdoor swimming pool and whirlpool offering the most beautiful views. The bars and restaurants, wellness facilities and hotels of Sava Hotels Bled offer daily discounts and benefits for hotel guests and visitors to Bled. ... Check the bars and restaurants and wellness facilities for discounted prices and other benefits prepared for you. Find out what is happening at Bled and the area during your stay. Parents should not overlook Zaki the Swan's bonus card for children that offers guests of Sava Hotels Bled free of charge benefits and discounts in Bled and its surroundings! The original Bled cream cake is the most recognisable feature of Bled. Even though it is over 60 years of age, it still boasts a tempting youthful taste, forever fresh and crisp. Since 1953, the confectionery of the Hotel Park has been diligently recording the layers of buttery puff pastry used to make these mouth-watering cream cakes. More than 13 million original Bled cream cakes were made in over 60 years. For these, they used about 380,000 litres of cream, more than 863,000 litres of milk, over 6,759,130 eggs, more than 112 tonnes of flour, over 300 tonnes of sugar and more than 78 tonnes of vanilla sugar. The authentic original Bled cream cake made according to the original recipe is only served at the Park Café and in the hotels and restaurants of the Sava Hotels Bled. More about the original Bled cream cake!